Last week I discussed a medical journal editorial which claimed that supplements don’t work and are just a waste of money. I ended by introducing the nutrient paradox – how it can be that nutrients, by definition essential for life, frequently show little benefit in supplement studies. This week I will examine some of the reasons for this paradox. Robert P. Heaney, MD, a world-renowned endocrinologist specializing in bone, calcium & vitamin D physiology, published an article in June 2013 titled “Some Rules for Studies Evaluating Nutrient Effects” which explores some reasons for this paradox. 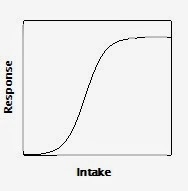 Heaney first looks at the dose-response relationship for nutrients which shows a sigmoid (S-shaped) curve when graphed. At low intakes there is no observable effect – there just isn’t enough to do the job. Then at higher intakes there is a strong response to increased dose. Finally at some level the curve flattens again and there is no additional benefit from taking more. Unlike drugs, any nutrient being studied will already occur at some level in the participants. The key is to know where on the curve the study population lies. In the case of the elderly physicians study mentioned last week, it’s likely that they were well-nourished with few deficiencies, so would be less likely to benefit from a multivitamin. This conclusion however cannot be transferred to other populations. The Women’s Health Initiative trial which found little to no benefit from calcium supplementation fell into a similar trap because the participants were already at or above the recommended level of calcium intake. Heaney asks, with apparent frustration, why this flawed study is still being quoted. Heaney also explains that the middle section of the curve where increasing dose increases benefits is generally much narrower for nutrients than for drugs, meaning there is a smaller range of intake that will show a particular effect. Nutrient studies will not detect any benefit outside of this narrow range which is approximately 1 order of magnitude (10x difference from the lowest to highest) for nutrients, compared to 2 or even 3 orders of magnitude (100x to 1000x) for drugs. And because the curve is not linear (a straight line), pooling data from studies with different doses, different participant base levels, and/or different durations (length of study) will produce confusing, misleading results. The first study mentioned last week was one of these.